Update January 23, 2019: Asos contacted EFF to apologize for the cease and desist letter. Asos said the letter should never have been sent and assured us that it would take no further action against our client. We welcome the apology and hope that this case serves as an example to others who might send careless or overbroad trademark threats. Sometimes trademark owners seem to think that they own ordinary words. In this case, U.K. clothing giant Asos sent a cease and desist letter [PDF] to an EFF client for registering a domain with the word “collusion” in it. Our client’s domain doesn’t have anything to do with clothing—it’s about contemporary U.S. political debates. It is about as far from trademark infringement as possible. Today, we sent a response letter [PDF] demanding that Asos withdraw its baseless threat. After seeing this tweet, our client registered “collusion.so” and directed the URL to the Lawfare blog’s coverage of connections between President Trump and Russia. Other people have also registered the domain names of Giuliani typos. Giuliani, who was once named a cybersecurity advisor to Trump, falsely claimed that Twitter was “invading” his tweets. What does this have to do with clothes, you ask? 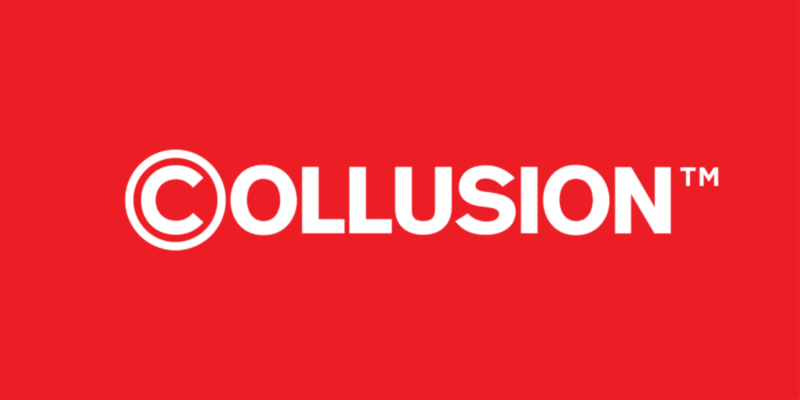 Well, in October 2018, Asos launched a new clothing line called “Collusion.” It describes Collusion as “a new fashion brand offering bold, experimental, inclusive styles for the coming age.” Not content with a vaguely dystopian branding choice, Asos followed up by sending a threatening letter to our client claiming that the registration of collusion.so infringes its trademark. If Asos and its lawyers had spent even a few minutes looking into things before sending their letter, they would have seen that they have no straight-faced trademark claim. While they might not have known the full backstory, two red flags should have stopped them before they started. First, our client registered the domain before Asos launched its clothing line. Second, the URL points to a page about the political meaning of collusion—not to anything about clothing. It’s very disappointing to see a trademark threat over such an obviously unrelated use of a common word. Asos’s letter to our client opens with large-type red text: “Failure to respond to this letter may result in further legal action being taken without further notification to you.” The law firm that sent the threat, Stobbs IP, has a history of abusing the universal domain-name dispute resolution policy, or UDRP, to try to take control of others’ domains. If Stobbs IP tried to do that to our client, it would be yet another attempt at reverse domain hijacking. We hope that Asos and Stobbs IP have enough sense to withdraw their threat. We also hope that this story serves as a lesson. Far too many trademark holders engage in mindless over-enforcement. Trademark law doesn’t give mark holders the right to censor criticism or the power to control the use of ordinary English words. Whether Asos likes it or not, people will continue to discuss collusion on the Internet.